Disclaimer: This post contains Amazon affiliate links, which means I may earn a small commission (at no cost to you) should you chose to make a purchase using my link. Please note however, I only include products that I use and love myself. Since I was a little girl, I have felt a pronounced sensitivity to other peoples’ energy, and an awareness in my bones that we are all somehow connected to each other within the Universe in some grander and more infinite way than we can perhaps fully understand. Even before I was ten years old I can remember noticing patterns and synchronicities in my dream life that correlated with my waking life — places I would go, people I would encounter, events that I would experience — and eventually I began recording my dreams in journals, trying to decipher what hidden messages might be woven into them for me. Inevitably I was drawn to the notion of divination; I experimented with mirrors, crystal balls and rune stones all before high school, and, naturally, found my way to the Tarot — never passing up an opportunity to have my cards read at beach boardwalks and summer fairs. I can still remember my first reading, eagerly seated on a plush velvet chair across from this angelic European woman with long black braids that hung at her sides, her delicate fingers shuffling my fate through her deck with a sort of knowing grace, and how carefully she layed each card out across the beautiful silk cloth that draped over her wooden table. I was thoroughly fascinated by the artwork in the cards, and marveled at what insights she was able to glean from them about my life. When I was in college I purchased my first deck and dabbled with readings here and there among friends and at Halloween parties, but it wasn’t until I lost my father to a heart attack in my early twenties that I began to study them more seriously, as my quest to apprehend the enigmatic nature of the human experience suddenly became more personal and I began to crave more meaning and purpose in my own life. I purchased a new deck — the same one that I still use today — and spent my nights examining the intricate imagery etched into the cards, laying them out in various spreads, delving deeper and deeper into the stories that they told and reflecting on how I saw myself in them. 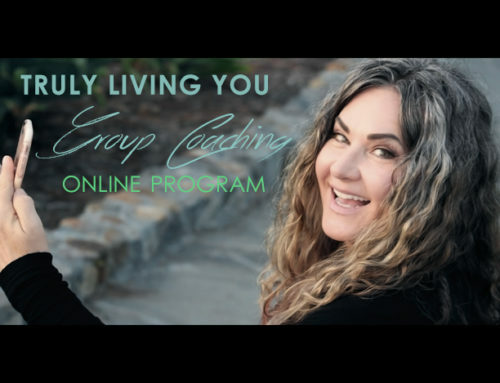 Following the guidance presented to me, I became more intimately attuned to my inner world and more mindful of how I was engaging and interacting with my outer world. The more I worked with the cards the more my true values began to come into focus. 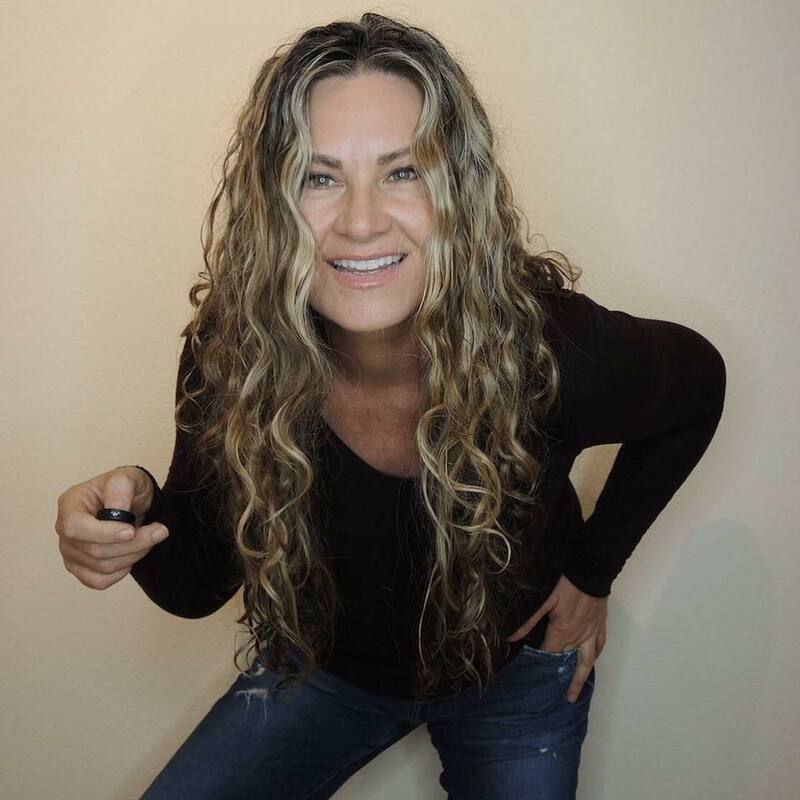 I started to understand why I felt so unfulfilled and what changes I could make to shift that feeling, and with this new sense of self awareness, I was able to make better decisions for myself that were more in line with what I stood for and what I wanted. Looking back now, I can say that I attribute a great deal of my healing process to the Tarot. Furthermore, since I’ve been reading for others in recent years, I’ve come to view the Tarot as a powerful tool to aid in self growth — both practically and on a spiritual level — as well as exploring how to best position oneself to achieve their goals, their desires, and ultimately to align with what is truly in their soul. But what is the Tarot, exactly? The Tarot is a set of 78 picture cards that echo various phases of consciousness. The deck is divided into the Major Arcana (Great Secrets) and Minor Arcana (Lesser Secrets), from which cards are drawn and placed in specific positions within a spread to reflect the core energies and influences surrounding the querent. The Major Arcana consists of a Fool card, numbered 0, and twenty-two subsequent cards numbered I – XXI that follow the Fool on his journey to enlightenment (ie. “the Fool’s journey”). These cards represent karmic energies and the archetypal life lessons that we are faced with, and typically signify opportunities, relationships or events that will have a lasting impact for the querent. The remaining fifty-six cards that make up the Minor Arcana represent energies that are more temporary, and are further divided into four suits — Pentacles, Cups, Swords and Wands — each of which are numbered ace though ten and include four court cards — a Page or Princess, a Knight, a Queen and a King. Each suit is governed by one of the four elements and carries energy specific to that element; The Pentacles are governed by Earth energy and represent material possessions, home, career and finances; The Cups are governed by Water energy and represent our relationships, emotions, intuition and creativity; The Swords are governed by Air and represent our truth, communication, decisions and actions; And the Wands are governed by Fire and represent our vision, passion, energy and purpose. The first known decks date back to the fifteenth century and were originally used as playing cards. In Italy, Carte de Trionfi, Cards of Triumph, was played similarly to the modern day game of Bridge. Tarocchi was another game played by the Italian upperclass, in which players would take turns writing poetic verses about each other based on the themes of the cards that were drawn. It wasn’t until the eighteenth century that followers of the occult world began to draw parallels in the artwork to real life situations and started using the cards for divination and fortune telling. As new decks were designed for this purpose, references to astrology, numerology and mythology were integrated into the artwork. The Tarot de Marseille is one of the oldest decks still used today that was popularized in the late 1700’s in Paris, rivaled by the Rider-Waite deck that was published later in the early 1900’s. Today, there are literally hundreds of adaptations to choose from — some upholding a direct nod to the traditional artwork while others have been completely and uniquely modernized. Though widely debated, there is an old saying that your first should be given as a gift. In my opinion, your first deck (or any deck, really) chooses you; To work with the Tarot is to develop a personal language with the cards, so I feel that it is important for the energy of the deck to truly resonate. When choosing a deck, spend some time observing the artwork — notice how the images speak to you, what symbols jump out at you, and how the cards feel in your hands if you are able to hold them. Tune in to what your intuition tells you and go with the deck that you feel most drawn to. Once you have found your deck, you want to cleanse and connect with it. 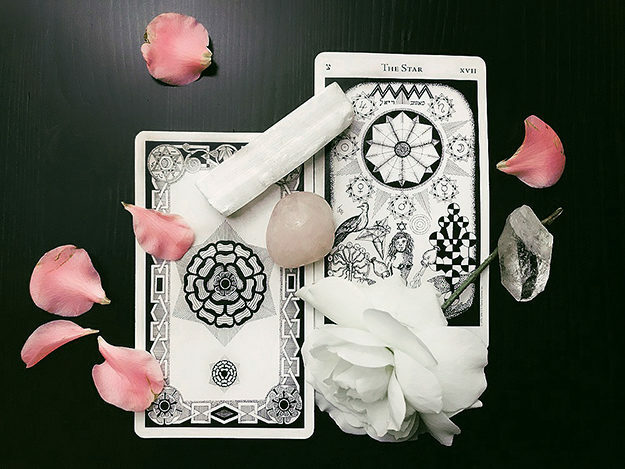 To start, you can smudge your deck with Sage or Palo Santo, then simply sit in meditation and hold each card in your hand one by one, taking in the imagery, the characters, the colors, the symbols, and reflecting on what stands out to you and what you feel. 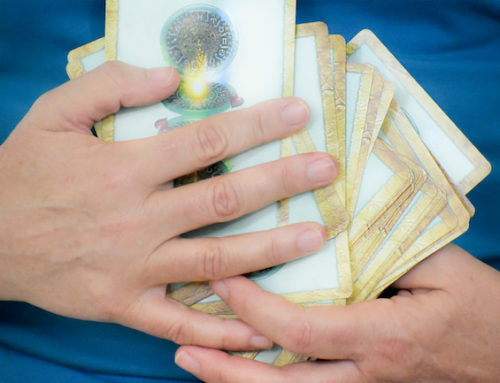 You don’t have to do this all at once — in fact, for a while I would just pull one card each night and journal about my reaction to it — the point is simply to devote some time to getting to know each card individually. Of course, each card does have a specific intrinsic meaning, and while there is a great deal of literature and information available in book stores and online outlining the associated themes and traditional spreads which are of course important to familiarize yourself with, I’d say that applying your own language and intuition is equally important, and ultimately will help you to remember the different meanings anyway. 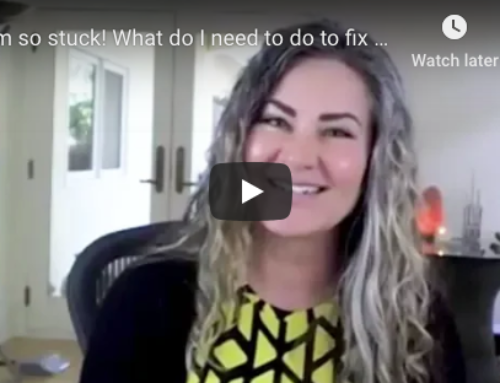 I believe that our greatest power is in the present, and that we each hold all the answers we need within us already — sometimes we just need a little help uncovering them. With that in mind, my readings are less based in “fortune telling” and more about examining where my clients are energetically right now, approaching my readings in a similar way that a coach would conduct a coaching session — posing questions to inspire and empower self reflection and positive action forward based on what I am able to assess in the cards. If you are interested in doing a reading with me, sign up below to book your appointment. 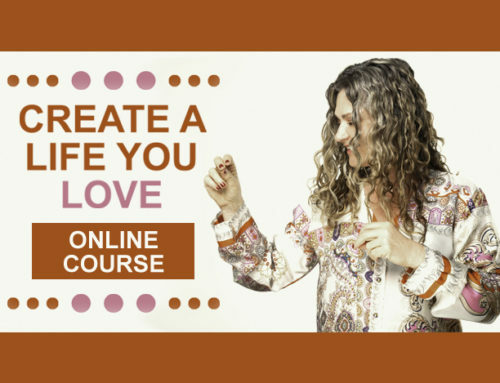 I am also running a five card special for the month of February, focusing on self love — and letting Lisa’s Truly Living Tribe know about it before anyone else! In this reading, I help you explore your current relationship with yourself, where self love is most needed, what to embrace, what to let go of, and what new energy to tap into.